»» NPR's "Talk of the Nation"
»» Studio session for Celia Cruz, Queen of Salsa, narrated and sung by salsa & jazz singer Michelle Manzo. NPR's "Talk of the Nation"
Listen to the interview (or read the complete transcript of the interview) with producer Arnie Cardillo on NPR's "Talk of the Nation" from Thursday, May 26, 2011. 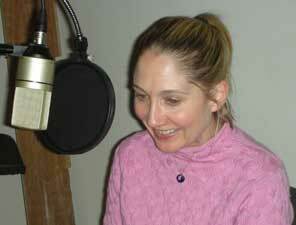 Live Oak Media: How is audio book narrating different from your other acting work? Jason Harris: For me, the beauty of audiobook narrating is that you can really create all aspects of the story, as opposed to playing just one character in a show or film and be in the hands of the director and editor. In audiobook narrating, you get to create the mood, the character's voices and intentions, and paint the entire picture in real time. I find there is real joy in the simple telling of a story. Peter Pamela Rose: Since I am only doing voice work (as opposed to in front of the camera and on the stage) audio books are a longer form for me. Usually I am touting the virtues of some product in a 30 second spot. LOM: What kind of preparation do you have to do? PPR: Jason and I listened to the first two audio books we did (Trick or Treat, Smell My Feet and Jingle Bells, Homework Smells) to make sure that we matched the voices and then read the books out loud trying out different voices. We bounce ideas off of each other and most of the time make each other laugh. JH: Preparation for me is essentially reading the entire book over and getting the mood and feel for it. Then choosing a style and voices for all the characters so I'm not searching for them in the studio. In longer audiobooks with a lot of narration I may mark some sections that could become tricky after hours of reading - putting brackets around certain phrasing, highlighting certain words and such. LOM: What is the biggest challenge with narrating? JH &Amp; PPR: Keeping your energy up and being consistent. This is more of a problem in longer books, but it can also be in picture books with a lot of characters, and when it's an ongoing series it could be tricky making sure the voices truly fit the picture as drawn and stay consistent. LOM: How do you work with the producer/director? PPR: With a lot of laughter. These characters are cute and Jason is naturally a VERY funny guy so he keeps everyone cracking up. It is a very free flowing relationship -- Arnie (Cardillo, producer) and Rory (Young, engineer) give us ideas and we give them ideas. Whichever works best is the one that you hear in the final production. It's a lot of fun recording with Live Oak. JH: The fun thing about working with Arnie and Rory is they are very much a part of the process, chiming in over the speakers with comments and notes, often very funny ones. The whole experience then becomes more fun, lively, and full of laughs...oh and hopefully the work is good too! LOM: How do you like reading with your spouse? JH: I love reading with Peter. It makes the day seem even less like work than it normally does. It feels more like we're just doing a fun activity together...go to the zoo, the park...or the studio! We also like to crack each other up and be creative together so the time really just flies by. LOM: How does it compare to reading alone? JH: Reading alone is more of a zen-like experience, especially on long books. It feels like a form of meditation. Reading with Peter is more like being at a mini-party and telling a story to the guests - even if those guests are a little younger than we are. PPR: It's not as much fun. I don't laugh as much. LOM: You do so many voices - any favorites? PPR: Patty is my favorite character and voice - she's such a know it all! JH: I don't really have a favorite voice. I'm excited if the voice really seems to fit the character and exudes personality. When that happens it is much easier to stay consistent and keep the energy up because I really feel personally in sync with the character and his - OR her - feelings. Why did you choose to produce Mack Made Movies as a video as well as a readalong? We usually look at books to see if they would translate well into audio, since we consider ourselves an audio producer, first and foremost, and produce only 1-2 videos a year. Don Brown's Mack Made Movies, however, was the first book that reoriented our thinking. In other words, we first thought of what a great video it would make, before we even thought about it as a readalong, because it was about one of the pioneers in filmmaking, Mack Sennett. We were also inspired by the illustrations, which in many cases were depictions of actual scenes in front of and behind the camera. What did you enjoy most about producing this video? One aspect that excited us about the project was that Sennett's films were made before color was introduced, so we thought it would be fun to take some of the color illustrations and convert them into black and white for the video, especially the illustrations that depicted actual movie footage. Early animation was also featured in the book, and we decided to create simple animation in the video in the same way it had been done in those early films-shot by shot. With the advanced techniques that are now available on the new digital editing systems, we uncovered a number of optical effects that we could use to make the video look like old black-and-white footage-worn out film with scratch lines, and human hairs moving across the camera lens. It's ironic that modern technology has enabled us to create the feel of old time movies. How is the process of making a video different from audio? Our principal focus as an audio publisher is to create an audio recording for our readalong productions, so we start with the audio production and make that first. Then we take the audio track and listen to it as we look at the illustrations, one by one, in order to determine how the art can be shot in order to synchronize it with the narration, music, and sound effects -- the equivalent of creating a storyboard, as it is done in real filmmaking. It's important to note that we use the original artwork when we shoot the video. Then the audio track is revised, if necessary, to make sure that it will match up with the video blueprint that we have created, and it thereby becomes the soundtrack for the video. We then shoot each piece of art while listening to the corresponding segment of the soundtrack to insure that the sound and visual elements work together as we had planned. The final step is to take all the video footage and the soundtrack into the editing room and piece it all together. As they say in Hollywood, movies are made in the editing room, and it is no different with our children's videos. Are there other videos in the works? Our next video will be of Eric Kimmel's book, Anansi's Party Time. It will be the fourth Anansi book by Eric that we will have made into a video--the Anansi books have become our most popular video series. What are your thoughts on audio downloads? We have our older audiobook titles available for download through Overdrive and Audible, as well as on Playaway units. We think these formats make sense for the older listener. Younger listeners, however, continue to do well with the tried and true, old fashioned cassettes. The cassettes are durable, and the format is easier for smaller hands to manage. Do you think listening habits are changing? Clearly, more people are listening to books on audio, even in our young market. Three year olds are on computers and kids are growing up far more techno-savvy than we did, and even more so than our young adult children did, so that certainly means change. But there's still a vast number of children holding books in their hands, looking at the illustrations while being read to by a person, or listening to the story on cassette or CD while reading along. We don't have statistics, just feedback from teachers and librarians who work with this age group and are quite loyal to the formats. And, many don't have the budgets to convert hundreds of books & audio in their classrooms and libraries to the latest technological trend. How do you feel about hearing computer-generated voice reading of text as in the Kindle? We think it has application for adult listeners who are interested in hearing informational material, like the news, rather than listening to a good book. The narrator's performance is one of the most important criteria in creating a good audiobook - listeners are expecting (and deserve) an effective and entertaining narration of the book. A computer generated voice is no match for a great narrator. In the case of readalongs, the need for a professional narrator or actor to read the text becomes even more essential for a good reading & listening experience. Children's books, especially picture books and beginning readers, have multiple characters, often from all genus of the animal kingdom, and part of the fun for young listeners is having the opportunity to hear the various characters come to life on the illustrated pages of the book. We don't think children will be too excited about reading and listening to picture books if a monotone computerized voice is reading to them; rather, they need a voice that captures the nuances of the characters and readalong pacing that is designed to hold their interest. How do you think your authors feel about the technology? We think authors are interested in new ways to get their books out to readers, listeners, moviegoers, etc., just like the publishers are. It's exposure, and nobody minds having a new revenue stream, as long as it's expanding their markets and not reducing them. And, as long as it's not compromising the quality of what they've created. What impact will these new formats have on children's book and audio publishing? It's probably too early too tell. Book and audio publishers continue to grapple with new technologies and try to understand their places in the market. At Live Oak Media, we do our best to accommodate our customers, and as long as they continue to request the traditional formats, we'll continue to offer them. At the same time, we are venturing into the world of technology -- as long as whatever format we put out there enables us to keep our high standards of production and delivery intact. We owe that to our ultimate customers - the children who are reading and listening. Laura Hamilton not only narrated the Winnie books, but also many books by Kevin Henkes, including Lilly's Purple Plastic Purse, Chester's Way and Julius, the Baby of the Worldfrom Live Oak Media. She has also narrated books by Judy Blume. We asked Laura about her approach. Live Oak Media: How do you prepare for your reading? Laura Hamilton: I read the book first to get the big picture and full story. My second, third and fourth readings (or however many are needed) are strictly for the characters. I mine out all the clues I can find that tell me more about each character so I can find the right voice for them. Once I have character voices in my head (and scribbled notes everywhere), I start reading the book out loud for familiarity, pacing and flow. I often look like a total crazy lady in various public places (like parks and soccer games) talking to myself in a variety of voices. I'm sure people wonder why I can't try "silent" reading as an option. LOM: How did you go about creating the voice for Winnie? LH: When something is written well, it is easy to hear the character's voice in your head because all the clues are on the page and the dialogue has a rhythm that is true to that particular person. Winnie's feelings and fears are so universal and recognizable that my own "younger" self found her easily. LOM: What are the biggest challenges in narrating? LH: I think making all the various characters distinct enough while keeping them realistic can be a challenge. And the more characters there are, the more there is to keep track of. It can turn your mind into psychotic scrambled eggs if you let it. LOM: Do you have a favorite story to share about narrating? LH: My first reading came about when Judy Blume lost her voice and reluctantly agreed to let me read her piece from Deenie while she stood next me at Steppenwolf in Chicago. She also mentioned that she really enjoyed reading her stuff HERSELF. I nervously asked her if she would like me to read it so she could direct me and she politely said no. What a bunch of jitters that was but it started my career in the biz! Then there was the time I showed up for a narration job having had food poisoning ALL NIGHT - dehydrated and sipping ginger ale, occasionally burping!! LOM: Any tips for parents or librarians reading a book during story time? LH: Well, being a bit dramatic already, I tend to believe in fully investing yourself in any story. It's fun, it's engaging for others and it's what I imagine the author would like us to do. LOM: How do kids react when they know you're the voice of Lilly or Chester? LH: A second grade boy I saw the other day told me he listened to Lilly's Purple Plastic Purse with his family. He said it was REALLY cool and they loved the whole recording. And though it's nice to feel the admiration from a young person, I think kids like discovering even more that a regular person can do something rather wondrous and that in turn makes them think about their own ability to interpret and perform a story they love, or perhaps try something else they had not considered before. Introduce students to Celia Cruz, one of National Public Radio's "50 Great Voices in Recorded History," with our sizzling readalong Celia Cruz, Queen of Salsa. Narrated and sung by salsa & jazz singer Michelle Manzo - seen here during a session at the studio - this readalong includes a track of Celia Cruz performing, along with Johnny Pacheco, her signature song Quimbara. Carol is an award-winning audiobook narrator, who has recorded over 300 full-length books for both children and adults. Her work for Live Oak Media includes Christina's Ghost, The Dollhouse Murders and, most recently, Crandalls' Castle. LOM: What kind of preparation do you do before the studio work begins? CS: That varies pretty widely with the book that I'm narrating; some books require a lot of research along with considering the major and minor characters of the book and what vocal choices might be best for them and for the text. I am fortunate enough to have a strong feel for the rhythm of the narrative styles of different authors - it's not necessarily something that I think about, but I know that once I start reading the book out loud, I will respond to that element of what the author has written. Obviously some authors make more specific choices about the voice of the narrative. Sometimes the characters' voices are described in some way by the author, and then I need to make decisions about how to interpret that; that can be a special challenge if the author has decided to give the reader some significant piece of information about the internal world of the character by giving them some kind of extreme vocal quality. I've narrated characters whose accents were described by saying, for example, that he had a strong Vietnamese accent, but had spent so many years in Paris that that was tempered by elements of a French accent. I narrated a character who had had some kind of accident that had destroyed his vocal cords and so he only ever spoke in a harsh whisper (I was thankful that he was only a minor character). Some books can tolerate strong vocal choices; some need a more neutral read. LOM: What is the biggest challenge with narrating Crandalls' Castle? CS: The biggest challenge with Crandalls' Castle was the alternating narrators - Sophia's own voice through her journal, and a third person narrator that primarily focused on Charli. Both girls are about the same age, both sets of narrative sections include scenes of dialogue with the same group of people (and often the other girl), and both girls are experiencing a great deal of familial and social stress, so they're both pretty anxious about these big events that are going on in their lives. They also both get defensive with each other and try to pretend that they're not struggling. Without sounding cartoon-ish or resorting to odd vocal tics or dialects, I think I'm safe in saying that most adult narrators only have so many anxious adolescent girl voices inside of them. So the difficulty was making them very noticeably distinct while still sounding genuine. It's very important that the listener like and understand both these girls and of course your vocal choices can influence how the listener experiences these girls. I tried to make choices with Sophia and Charli that had to do with rhythm, with how hard they might push vocally. Charli is a little more vocally forceful, while still being a girl her ag;, Sophia a little more withdrawn. I also made choices with timbre and pitch. But those distinctions ended up being fairly subtle ones, and so I had to make pretty specific choices from scene to scene. CS: Arnie [Cardillo] and I have worked on several projects but have never been in the studio together. Early on in our working relationship we'd talk about the book; then I would record some small sections of the book and send them on for approval; then we'd usually discuss choices and modifications over the phone. After a few projects, we moved to discussing the book first, then I'd record a solid section of the project - a third to a half - and he'd review it; most changes at that point were pretty minimal. We've developed a really great working relationship - I think we trust one another's instincts about a book. In general, I prefer to work alone in the studio. I tend to lose myself in the book when I read and rely on falling fully into the rhythm of the text. I've worked with producers that like to listen to that process and that's great; I generally forget they're there pretty quickly. I probably wouldn't work well with a producer that prefers to work line by line or paragraph by paragraph. 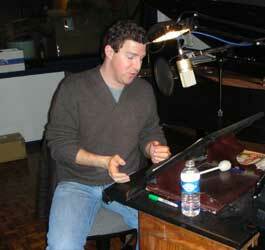 I think of narration as more of a distance sport; the marathon running of voice acting. LOM: Is it easier or more difficult to read stories with a good deal of narration or of dialogue? CS: There are stylistic choices that a writer makes that can create narration or dialogue that is tricky. For instance, dialogue written in dialect can be really rough to narrate accurately. I tend to really enjoy what other narrators might consider to be complicated narrative styles on the part of the author; quirky first person narrators that wander around in stream of consciousness, for example, or dramatic changes in narrative voice, or the use of heightened language. For me, the bottom line is that if the material is well-written I'm pretty happy; then it's just a question of figuring out how to get out of the way and let the writer do the work for me. I don't have to invent or impose a style because it's already there. With adolescent fiction, it can be difficult to find strong writers - if the author is writing down to children, it's nearly impossible to keep that out of the narration; it's really a struggle, and having to fight that for an entire book is ultimately a losing battle. Arnie makes good choices about the texts he produces - he finds authors that speak clearly to their audience and create fictional worlds that have integrity. That makes my job much, much easier and much more enjoyable. Crandalls' Castle was really fun to narrate. LOM: You've narrated a number of mysteries - is that genre one you especially like and look to read? CS:I love to narrate mysteries, though I rarely choose them for my own reading. Every once in a while I'll go through some giant phase of reading mysteries back-to-back, but that's unusual. I really enjoy narrating mysteries because the characters are forced into interesting, entirely unexpected trajectories, and moving through that with them is an engaging process. I don't think of myself as "becoming" the characters that I narrate, but I am certainly engaged with them empathetically on what feels like a pretty deep level. There are times when things I have not planned come out of my mouth when I narrate; responses that are true to the text, but not anything I really "planned", and there's something about the structure of a mystery that allows that to happen with some regularity. CS: Like I said before, I often really get lost in the books I narrate and that can create a kind of fallout in the studio. I was once recording a book about the relationship between people and dogs (I share my home with several dogs and have had dogs for many years), and there was an entire chapter on dog death and how we respond to it, and I had to send the technician that was working with me down the hall because I had to stop narrating every other sentence and cry, even though I was also aware of how ridiculous I was. But there's something about letting the text come out of my mouth - I just fall into it and there's nothing to be done. And sometimes it's not even that the book is sad; it's just that the book is over and my time with those people and that experience has come to a close. I once wept through the closing announcements of "To Kill a Mockingbird", so I had to keep turning the microphone off. At the other end of the spectrum, it once took me nearly 45 minutes to record one page of a book because I was laughing so hard - I just couldn't get it out. I'd finally pull it together and then my engineer would lose it. I had to send her down the hall too, just so I could finish. I'd probably still be there. But I think all those things go back to my favorite part about narrating - the sense of, however, briefly, getting to embody the book. With some books, that can be a bit of a trial, with many books it's a great experience, and with some books, it's a life-changing experience. LOM: What are 3 pieces of advice you have for parents or librarians reading a book during story time? CS: I think one of the most important things to remember when reading a book aloud is that it's not about you. We all love to hear ourselves reading text that we enjoy - there's something very pleasing about speaking the words that tell a story we like to tell or that expresses an idea that is meaningful to us. Or we get caught up in trying to make our voice sound really good as we read. But, in narration, I believe that you have to set those feelings aside and focus on becoming a vehicle for the book itself - not that you don't get to have fun with the text, but it's a different feeling, or at least it is for me. People haven't come to hear my enjoyment of the book, nor have they come to listen to the fantastic qualities of my voice. They've come to listen in order to allow the book to unfold in their own minds, and if I'm not careful, I can push myself in front of that. I don't ever want any of my listeners thinking about *me* - I only want them to think about the book. It's perhaps a subtle distinction - I serve the book, rather than the book serving me - but I believe it's something that the best narrators do, whether they think consciously about it or not. Reading aloud is also an intimate thing, even if you have to project your voice to a sizeable crowd. Even if I'm reading to a lot of people, narration is still about the sound waves leaving my body, traveling through space, and touching the eardrums of each individual person there. Sometimes I even try to visualize that, to remind myself of the importance of that visceral relationship. In the studio, I try to remember that, especially since many people listen to audiobooks with headphones, that I'm literally speaking directly into the listener's ear via the microphone. It's a tender relationship, and it's important to protect it.